"You had the existence I could only dream of. Every pleasure at your disposal and you wasted it. You don't deserve this life, Clark, but I do." These kinds of characters have a lot of envy. They don't just want to be like the person they envy. They literally want to be the person they envy and live their life. Not that they will admit it. These kind of characters are often Woobies and Jerkass Woobies hence the reason they don't like their life. They will try to be close as possible as the person they envy and/or simply become obsessed with surpassing them. Given the right circumstances, these kind of characters will swap places with the person they envy. This can result In Grand Theft Me. May lead to being Driven by Envy. This is a very extreme form of Irritation Is the Sincerest Form of Flattery. Expect lots of Ho Yay if both characters are of the same gender. In the romantic comedy Orange Chocolate, the lead girl makes a wish to be like the guy she adores. She's envious because he is a prodigy onnagata, i.e. male performer of female roles, and she feels he is more beautiful and graceful than she is. Then something happens. Guess how it goes wrong. In an episode of Detective Conan. A moderately wealthy stock-trader murders his brother - a previously-successful and prize-winning novelist who spent too much time resting on his laurels and just loafing about, leeching off of his brother (he had some blackmail material about illegal insider trading, so the brother couldn't kick him out). The twist was that the stock-trader didn't murder his brother for blackmailing him, or for living off of him - but because he admired him. He despaired at seeing his once-great brother sink into laziness, and decided to become him, so that he could bring back the brother he'd once admired. But of course, he'll first have to get away with murder... which won't happen while Conan is around! Puella Magi Madoka Magica Spin-Off Kazumi Magica: The Knight of Cerebus Yuuri is actually a girl named Airi, who wished to become her the real Yuuri after she died. Deadman Wonderland: Hagire Rinchinchou wants to become Shiro, a young girl with powerful "blood-bending" powers that he experimented on. To a guy like him, wanting to unite with a Person of Mass Destruction is the closest he's ever felt to being in love. Gundam Seed Destiny: Meer Campbell for Lacus Clyne, of course. Being a Lacus fangirl, then having her face surgically changed into Lacus' seriously messed with her sanity. In the very dark Spider-Man storyline "Fearful Symmetry: Kraven's Last Hunt", Kraven the Hunter drugs Spidey and buries him for two weeks while he imitates the wall-crawler. He proves to be unbelievably brutal to the point where even Peter's new wife knows it ain't him. Lex Luthor under the influence of the lasso of truth admitted the reason he hates Superman is because he wants to be Superman. Hugo Strange. He was so obsessed with Batman he eventually wanted to become him, using genetic engineering and training to get himself to physical condition, and even manages to deduce Batman's identity. He even managed to defeat Batman and actually took his place. Hush, or Tommy Elliot, has similar issues towards Bruce Wayne, going right back to being jealous of his parents death in childhood. He even got plastic surgery to look identical to him. Single White Female, Trope Codifier. Alison Jones' roommate starts to take over her life, including dressing like her and impersonating her to seduce her boyfriend. In The Chronicles of Narnia: The Voyage of the Dawn Treader, Lucy Pevensie envies her sister's life and beauty. She has a dream where she is actually Susan Pevensie while she was never born. She almost uses a spell to look exactly like her sister. In The Roommate, Rebecca feels this way toward her roommate Sara. Black Swan, Nina to Beth. I just wanted to be perfect like you. In a spoof |Mission Impossible 2 featurette about the stunts, Ben Stiller plays Tom Cruise's stunt double Tom Crooze. Throughout the segment Cruise is clearly struggling to write off Crooze's antics as anything other than obsessed or insane. It's also revealed that even when they don't request Crooze's work on a particular Cruise film, he just shows up anyway. Taken to a disturbing extreme in The Talented Mr. Ripley. In Disney's Animated Adaptation of The Jungle Book, King Louie sings a musical number "I Wan'na Be Like You" about how much he envies humans. The extended cut of the second Spider-Man film reveals that for all his supposed hatred towards the webslinger, J. Jonah Jameson secretely wants to be Spider-Man. After Spider-Man quits and discards his suit, Jameson buys it and later is shown wearing it, jumping onto his desk and pretending to shoot web. This is Edward Nygma/The Riddler's motivation in Batman Forever, to the point that Nygma copies Bruce Wayne's hairstyle and facial mole. Cosmo Lavish is obsessed with becoming Lord Vetinari, to the point where he wears a duplicate of Vetinari's ring, practices facial expressions in the mirror all the time, and has his assistant steal worn out pairs of Vetinari's shoes. Then there's an entire ward in the hospital of people who want to be Lord Vetinari and have regular eye brow raising competitions. Cosmo joins them at the end of the book. Though not as dramatic as in the film version, Lucy in The Voyage of the Dawn Treader is jealous of her older sister Susan's looks, and almost uses a spell that would make her the most beautiful girl in the world (and not, in fact, like her sister at all). Sweet Valley High featured a plot involving a psychotic girl named Margo, who happened to look identical to Elizabeth and Jessica and was so jealous of them that she planned to kill one of the twins and take over her life. Later, Margo's own identical twin shows up and they both decide they want to become the Wakefield twins. The spin-off series Sweet Valley University had a book that copied Single White Female almost exactly, with Isabella acquiring a roommate who wants to become Isabella and starts taking over her life. In both The Best Friend and its sequel in the Fear Street series, Becka Norwood's life is invaded by Honey Perkins, who claims that they used to be best friends until Honey moved away. Becka has no memory of Honey, but Honey proceeds to both invade Becka's life and copy it, right down to dating and then breaking up with Becka's ex-boyfriend. Eventually, Honey attempts to murder Becka's actual friends and her boyfriend. In the sequel, Becka is trying to start over at a new school and make new friends, until it starts becoming apparent that the strain of Honey's memory is causing Becka to become like Honey. It turns out that the first portion of the book was from Honey's point of view, trying to start over as Becka. In the second portion, we learn that Honey was really Hannah Paulsen, a classmate of Becka's from elementary school. Hannah was an utterly needy and whiny kid desperate to be part of Becka's circle of friends. One day Becka and her friends had Hannah completely humiliate herself to become part of their group, then tell her she never stood a chance just to get her to stop bothering them. Sadly, Hannah would then witness her father murder her twin brother, mom, and then himself. Becka had completely forgotten about the incident and felt disgusted with herself that she could've been so cruel. R.L. Stine has tried a few different spins on this trope. In another Fear Street story, an Accidental Murderer takes on the persona of her victim, both as a kind of penance, and as a kind of denial (if I'm her, and I'm alive, then she can't be dead, so I can't have killed her, right?) It's hinted at first that she might be responsible for a more recent string of murders, but the real culprit is actually seeking revenge for a separate incident. As part of confronting him, she's forced to accept herself, setting her on the road to recovery. In another Fear Street story ("The New Girl"), a girl who is insanely jealous of her sister kills her and takes on her identity. Source of the quote for this trope: In Smallville, Bizarro started as a pure evil wraith. He was viewed as a monster by his creators and trapped in the Phantom Zone. He never knew happiness. When he was freed from the Zone he possessed human bodies to survive. Until he got Clark's DNA, memories and powers. He tried to replace Clark while he was trapped in the fortress. He fooled both his friends and the audience. At the end he was "killed" by his only love. This of course made him a Jerkass Woobie. Smallville had done this in the first season as well, with Tina Greer (played by Lizzy Caplan), a shapeshifter who grew up envying Lana's seemingly perfect life. When we meet her, she has already styled her hair to resemble Lana's and dresses in clothes that are basically the same clothes that Lana wears...even going as far as buying an emerald necklace to imitate the kryptonite necklace Lana wears (that was made from the meteor that killed Lana's parents). And then... It Got Worse. After the death of her mother (which she was responsible for), Tina shapeshifts to impersonate her mother while concocting a story that her mother is moving to Metropolis, and asks Lana if she can move in with her and Aunt Nell. When Lana says that she needs to ask Aunt Nell for permission (a perfectly reasonable point), Tina freaks out and takes this as a sign of rejection... and then decides that she's going to murder Lana and use her shapeshifting abilites to assume Lana's identity, even going as far as practicing writing Lana's signature multiple times as preparation. She returned in Season 2, and by this time, Tina has realized that the real source of her Lana-obsession is that she is in fact in love with her... and is willing to, quote, do "ANYTHING to be with her." Star Trek: The Original Series episode "Turnabout Intruder". Janet Lester was not appointed as a starship captain because of sexual discrimination by Starfleet (which Captain Kirk admitted to). Due to anger over her mistreatment she goes insane and uses an alien machine to switch bodies with Kirk and take command of the Enterprise. Star Trek: The Next Generation had an episode called "Hero Worship" about a boy who wanted to be Data, mostly so he wouldn't have to deal with the negative emotions of losing his family. The Eureka episode "Your Face Or Mine" is about a previously unseen character who really wants to be Jo—and develops a DNA-alteration technology that allows her to be. In Wonderfalls ("Karma Chameleon"), Jaye befriends a woman who then dresses up like her, begins to impersonate her (even fooling her mother), and steals her job. The woman seems to have an unhealthy obsession with her. It turns out she's a scholar studying Jaye's way of life. Happened on JAG when one of the minor character's old friend moved in with her and started doing her hair in the same style, trying on her uniform, etc. on her way to full-blown stealing her identity. Castle: (softly) She's just committed to the role. (leaving the office) You should be flattered. Beckett: (to self) Yeah. Sure. Until she steals my boyfriend and kills me in my sleep. The Fraggle Rock episode "I Want to Be You" is all about this. Red gets jealous of Mokie for being (so she thinks) more popular than her, and spends the episode trying to imitate Mokie's hairstyle, voice, touchy-feely new age poetry, etc. It's been hinted that in Doctor Who, Rory Williams wanted to be more like the Doctor. Growing up, his friend Amy(later fiance, later wife)always made him dress-up and play as her imaginary friend 'The Raggedy Doctor'. Steven Moffat revealed that the only reason he became a nurse was him trying to be a doctor. When the Time Lord actually returned, Rory found himself competing with him. Eventually, though, Amy chose him anyway, and he's become far more comfortable with himself. No doubt the fact that, since becoming a companion, he's taken so many levels in badass he's broken the scale has helped his self-esteem. The Doctor himself is like this with humanity: in "Father's Day" he congratulates a pair of newlyweds by telling them that their life is "the adventure he can never have." This was Faith's motivation in Buffy the Vampire Slayer. She wanted Buffy's friends, family, job, role models, lovers, and this would eventually lead to her Face Heel Turn. Then she gets the chance to be Buffy and be heroic as her, slipping Faith out of the massive Jerkass phase she had and leading to a Heel Face Turn. Ironically, most of what Buffy had that Faith wanted she gets. "Richard Cory" in a song by Simon and Garfunkel, even after Richard Cory "put a bullet through his head." Which was based on the poem "Richard Cory" by Edwin Arlington Robinson. Busted - "She Wants To Be Me"
"David Watts" by the Kinks. "Invidia" by Delain. I don't wanna be like you/It seems like you outrun me every time/I want to be you/But why can't I erase you from my mind? Kingdom Hearts gives this one a little twist. Riku was always the cool one, the strong one, the popular one, and the special one, but he's spent his life intensely jealous of his best friend, Sora, for his simple mind and easy-going personality. And when it becomes clear that Sora, not Riku, is the hero of the story, Riku's envy finally drives him off the deep end. In The World Ends With You, Shiki was incredibly jealous of her outgoing, talented best friend Eri. So much so, in fact, that when she entered the Reaper's Game, she essentially became Eri, copying her appearance and bubbly personality after she lost her real appearance as her entry fee. Thankfully, her Character Development allowed her to come to terms with her issues and learn to appreciate her true self. Used very weirdly in Tsukihime, Kohaku who was naturally shy desperately wants to become her twin sister Hisui who was naturally cheerful. Her sister goes along with this because Kohaku was raped in her place so she could live a normal childhood. Kohaku becomes a Stepford Smiler and Hisui becomes a Emotionless Girl. In the Sonic the Hedgehog franchise, Metal Sonic, the first Evil Knockoff Eggman made of the eponymous hero, is either completely deluded into thinking he is the genuine article and wants to destroy Sonic believing SONIC is the knockoff, or he knows he's a copy but believes that he is superior and constantly challenges Sonic to prove it. Of course, this is Depending on the Writer. Young Link tries to use this as an excuse to avoid being punished when he's caught in Peach's room. Things don't go as planned. 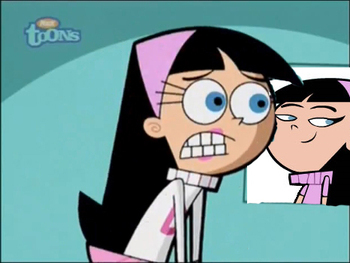 In The Fairly OddParents Veronica Star, a popular kid, is very jealous of Trixie's life. Mainly because she is more popular than her. And more importantly because Timmy is after Trixie and not her. She is hinted to be crazy. In the SpongeBob SquarePants episode "Big Pink Loser", Patrick wants to win an award just like SpongeBob, so he decides to dress and act just like him. On one episode of The New Adventures of Winnie the Pooh, Tigger tries to teach Eeyore how to be more cheerful. Eeyore interprets his lessons as "being just like Tigger", and soon he's painted himself in orange and black stripes and bouncing the others. In The Amazing World of Gumball, Robot Kid Bobert wants to Become a Real Boy, so Gumball tries to teach him how to act like one. Bobert then gets the idea of becoming - and, eventually, replacing - Gumball. This page was last edited on 9 April 2018, at 20:33.